Should We Just Get Rid of Auto Efficiency Regulations Altogether? Clean energy advocates are condemning EPA’s push to weaken vehicle efficiency standards, but a handful of free-market conservatives believe there’s a superior way to promote fuel efficiency. Vehicle efficiency rules are championed as a way to improve air quality, combat climate change and save drivers money at the pump. With the latest federal standards under threat from the Trump administration, free-market experts say there’s a better policy that can achieve the same goals. Instead of forcing automakers to comply with Obama-era efficiency standards, clean tax cuts (CTCs) could be used to reward companies that produce cleaner vehicles. The lower the fleet emissions, the lower the taxes on capital. Richardson originally thought up clean tax cuts in 2001 as a means to encourage renewable energy development, but didn’t publicly present the concept until 2016. After a brainstorming session with scholars and industry experts at Columbia University, fuel economy standards emerged as an ideal application for CTCs. Unlike wind and solar, the automotive sector has well-defined metrics in place that can be used to set tax rates. The R Street Institute, a free-market think tank in Washington, D.C., released a policy study last year on replacing fuel-economy rules with CTCs. The paper proposed setting a single vehicle-efficiency target and using it as a baseline for rewarding automakers with tax cuts. Companies would get breaks on corporate income taxes, capital gains taxes, estate taxes and earned interest taxes paid by shareholders and bondholders. Researchers say CTCs would solve many of the problems with current federal standards. For one, a sliding scale for tax breaks would motivate companies to exceed emissions targets, rather than stopping when a minimum target is met. Automakers also have little incentive to meet Corporate Average Fuel Economy (CAFE) standards, because the penalties for non-compliance are relatively low. Since the first emissions regulations were introduced in 1970, fuel efficiency has jumped from under 14 miles per gallon to more than 24 miles per gallon for new U.S. cars and trucks, according to the EPA. But critics are quick to attribute those gains to rising fuel prices, rather than federal rules. The current system is also criticized for being inefficiently regulated. 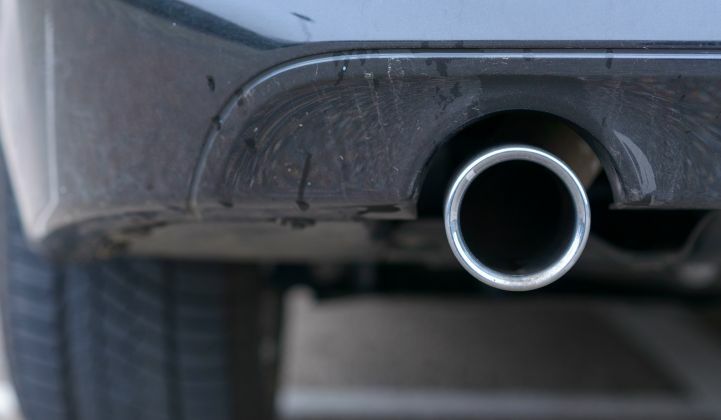 Three different agencies oversee emissions and efficiency rules: the EPA, the California Air Resources Board (CARB) and the National Highway Traffic Safety Administration (NHTSA). “Any time you’re trying to get three approvals rather than one, it can be pretty bad. Imagine having three supervisors at work,” said Neeley. The EPA first placed regulations on vehicle emissions in 1970 under the Clean Air Act. A second mileage-based regulatory system emerged in 1975 as a means to conserve fuel following the Arab oil embargo, which became the CAFE standards that are overseen by the NHTSA. To complicate matters, California received a federal waiver in 1970 that allows it to impose its own fuel-economy standards. A CTC system would theoretically be overseen by a single agency and use one method to measure vehicle efficiency. Automakers have lobbied the Trump administration to weaken CAFE standards, saying it’s difficult and expensive to meet the gas-mileage targets, which in turn raises the price of vehicles for consumers. A CTC system would fix that problem too, according to researchers. Richardson says he’s received positive feedback on his idea from Republican and Democratic lawmakers, many of whom are interested in CTCs’ potential to boost clean energy beyond the automotive sector. Now that CAFE standards are on the EPA’s chopping block, R Street is likely to release new reports and proposals on the benefits of CTCs, says Neeley.